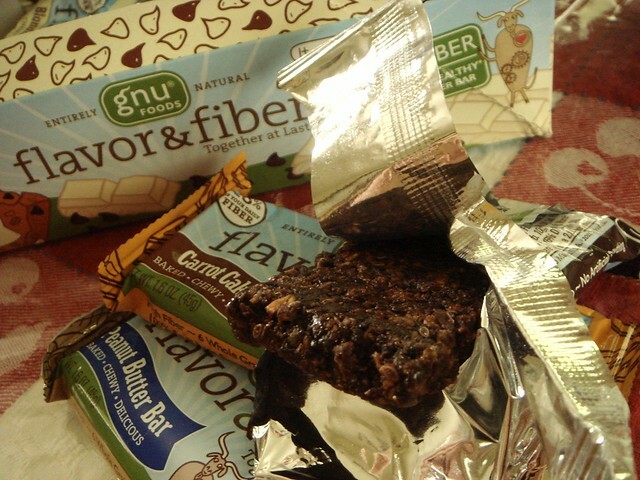 Gnu Foods contacted me a week ago to ask if I would be interested in reviewing their bars. I haven't tried Gnu bars before so I was interested to see if I'd like them. Gnu bar, made from natural ingredients, packs a whopping 12 grams of fiber per 130-140 calorie bar, which comes out to around 50% of the daily fiber. The bars come in nine different flavors, and three new dessert-inspired flavors (blueberry cobbler, blondie, and carrot cake) that were recently added to the line up. What I liked the most was the chewy, moist, and dense texture of the baked bars. The flavors that I've tried were all delicious and weren't overwhelmed by any one ingredient. The sugar content of the bars ranges from 7-11 grams, while the fat ranges from 3-5 grams. I admit that I was skeptical that these bars would actually keep me full; typically, I respond better to protein and fat for staying satiated than fiber. Fortunately, I'm glad to eat my words on this one. The bars do a great job keeping you full without feeling bloated. Visit the Gnu Bar website to see the flavor options. Leave a comment with the flavor you would most like to try. Like Gnu Foods on Facebook, then leave another comment to let me know. Winner will be chosen on Friday, June 8th. This giveaway is open to US residents only. If you're interested in trying Gnu Bars right away, you can buy a customized 5-pack for $7.95 with free shipping. The bars retail for $1.99 individually so that's a pretty good deal. Sampler pack info. Usually I'd head right for anything peanut butter but the blondie flavor sounds pretty interesting! I liked them on FB too. :) Thanks for the review...always looking for a good bar! The blondie and blueberry cobbler flavors sound delicious! Blueberry Cobbler sounds superdelicious! I'd love to try it...thanks! I think the Carrot Cake would be phenomenol! I'd most like to try the Cinnamon Raisin. I liked Gnu on facebook. The bars looks good. I'd like to try some. 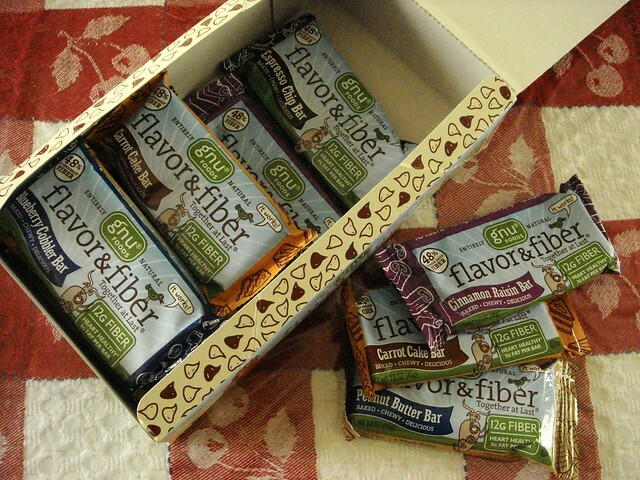 I could use a little more fiber in my life. Heh heh heh heh. I want to try the carrot cake, but the blueberry cobber sounds good too. "Heh heh heh heh" made me crack up. The espresso chip sounds like it would be the perfect mid-afternoon pick me up to fight off that 3 pm blood sugar crash. i also liked gnu foods' facebook page. I liked Gnu Foods on Facebook. I would really like the peanut butter bar. I'd like to try the blueberry cobbler! I like Gnu Foods on Facebook (Sheila Korman)! I'd love to try the Espresso Chip flavor. Usually I tend to gravitate towards the fruitier flavors, but this sounds awesome! Also, I've been looking for something to replace my daily morning coffees (because it's hurting my body...and my wallet!) and this looks like it'll do just the trick! I wantto try the carrot cake! I just tried the chocolate brownie, it was suprisingly really good. Very real chocolate flavor. I've never tried gnu bars before either. I'd go for the PB ones!